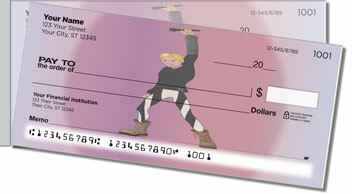 Satisfy your inner rock star with a set of these fun and funky Rock Star Side Tear Checks from the Music Checks collection at CheckAdvantage. Whether your just starting out in a garage band or you've played hundreds of gigs, our Rock Star Side Tear Checks are a great way to show your passion for plugging in! Who says "Don't rock the boat"? You'll rock anywhere and everywhere you go! 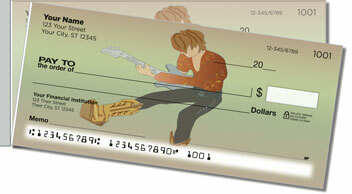 When you pick Rock Star Side Tear Checks, you're not only getting a super-cool set of music-themed checks -- you're also getting a terrific value, too. That's because our side-tear checks separate so cleanly from the pad -- your completed documents won't rip in the wrong place. 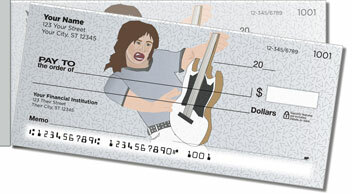 That means fewer voided checks! 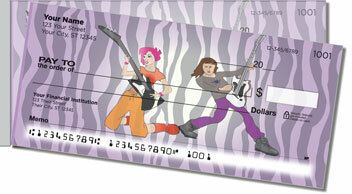 We even offer this cool collection as a set of return address labels to match your new checks. Make them yours today!